BBQ season is upon us! 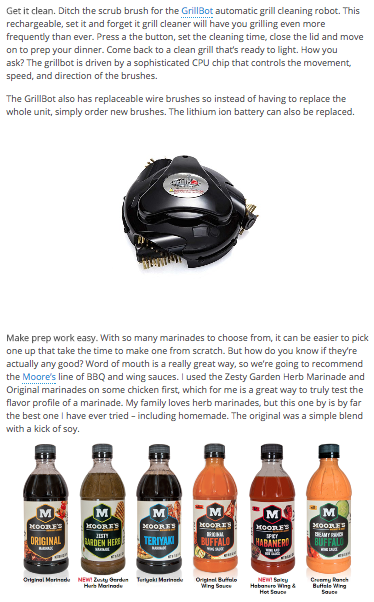 Chic Execs clients – Moore’s Marinades & Grillbot were both featured on The Celebrity Cafe in their article, Spring Into Barbeque Season. A simple push of a button sends the Grillbot scurrying about, scrubbing away all that charred meat and burnt-on marinades from last summer. Its design allows it to be left on its own and will alert you when the job is done. Moore’s Marinades and Sauces is an ever-expanding line of marinades and sauces, we provide #MooreFlavor for any cooking occasion. Share and enjoy!